This isn't a tutorial, just how I created my case mod. I doubt this is the best way to go about making this. Have any sugestions how to do this better? Let me know via email at catfish@halfdone.com. I've done a few mods for my Lian Li case, hid the cdrw, got a slot cut for my slot dvd, and got a cover for the floppy drive. One thing I also wanted to do was a neat hd activity display. 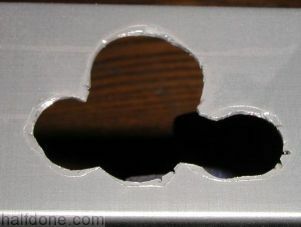 I have a nice, all brush aluminum case and the last thing you want to do is put in anything that would ruin that. It would, like my drives, be designed as part of bay cover. I named my system Megaman and all my systems have a sticker with a picture of the character(s) it's named for. 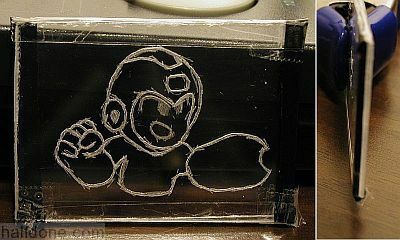 So I thought I'd make a megaman logo with Plexiglass lit up in blue and the hard drive access as bullets! When looking on the web for case moding I ran into Metku Mods. 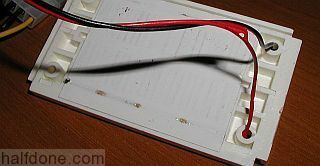 What I like about this site is they have minor but original mods like glow pads and keyboard lights and not just case windows and blow holes. My case insides are usually a mess and I like to sleep in as dark a room as possible and don't want my computer to be a bright night light. I ended up basing the electronics for this project on Animated leds, Episode 2. If I take this project but put the leds in a straight line it would look like bullets. More on the electronics later. I've only done a few jobs with a dremel or cutting metal in general so this was a learning experience for me. I did make some shelving for work out of power supply enclosures so I got the basics for dremeling but don't take these steps as the best way, I'm sure it's far from it. But I took a lot of pictures. Note that it's a mirror image of the final layout. I read it's better to etch the back side. I guess it would help with dust too since I cover that side. 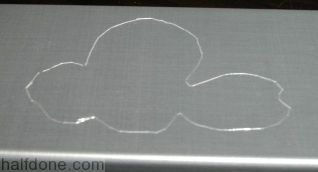 I then cut it out leaving a bit of a border and tape it backwards to the aluminum bay cover and using a exacto razor cut the outline into the aluminum. Now that I see what we need to remove, I covered the whole bay cover with a magical tape called Electrical tape, great stuff. 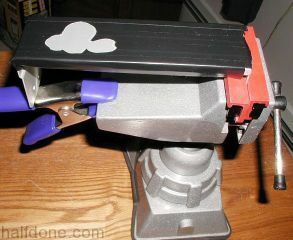 The reason for the tape is to prevent accidental hits when working with the dremel. On my 2 previous tries I keep hitting the cover with the dremel shaft marking it. After tring different tapes I found electrical the best. 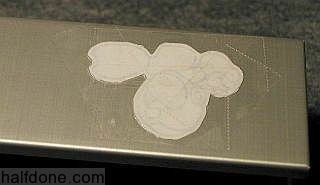 You can still see the outline of the cutout so I then get out the exacto razor and cut it out. 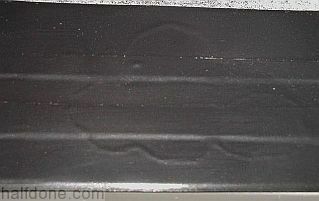 As you can see electrical tape stretches so make sure you don't follow the tape outline but the razor outline. I of course forgot this. Oh well. I also mounted it securely for cutting. Or at least close enough. The dremel bit I decided to use was the cheap cutting wheels. This project is pretty small (the cut out is just over 2.5 inch by 1 inch) and these start smaller but also grow smaller quickly. I need to use the smaller sizes for smaller details. They are also thinner. The reason I put "Watch out for this part" is because I keep hitting that against the edge of the bay cover. But thanks to the tape, you can see where I hit it but it didn't damage the cover. I originally created the slots around the edge thinking I can then bend them. Well that doesn't work. I was trying to save myself from using too many sanding cylinders. To remove that much I had to use 3 or so of them and they are not cheap. I need to figure about a better way to do this. 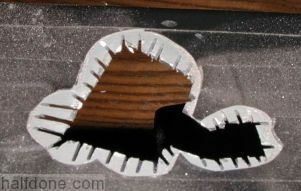 Perhaps not use a dremel and use a band saw or something. I got out the small files and finish the rest of the edge by hand. Now for the megaman carving I had to get some Plexiglass or something like that. Plexiglass doesn't seem cheap and I found something that would likely suit my purpose, jewel cases. The plastic is thin and I don't need much of it. I cut out two pieces with a utility knife and tape the template to the bottom side. Using my razor I carve the outline. I put in the 2nd piece on top of this one and carve the face. In previous tests I found that this is not enough and you don't see it too well from far away. So I get out a very thin pointed file and make the lines deeper. As you can see below it looks pretty bad up close. I did it three times and I can't seem to do better then this. I haven't tried using Plexiglass before so I don't know if this is typical or more likely jewel cases don't work as well as I thought. Luckily it doesn't look that bad further away. I then put the two sheets together with the face behind the body and taped the top edges together. you can see that I added electrical tape to the face sheet along the left edge and tape on the right edge for the body edge. I light the body on the left side and the face on the right. The black opaque tape prevents the different colored lights from effecting the wrong sheet. I then drilled 8 tiny holes for where the bullet lights will show. I used the smallest drill I can find since I want it unnoticed until it shoots. Now I can get back to the electronics. 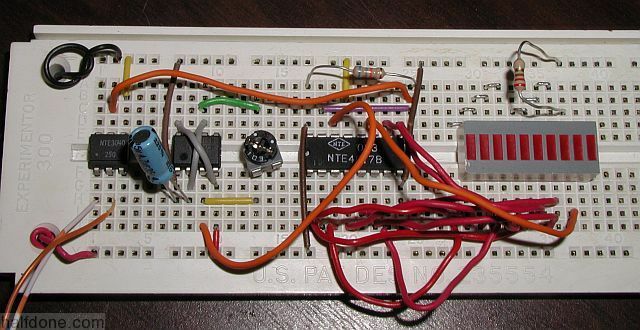 I am new to electronics, while I understand how this circuit works I wouldn't be able to do this from scratch. And I also blew out two optocoupers working on this. 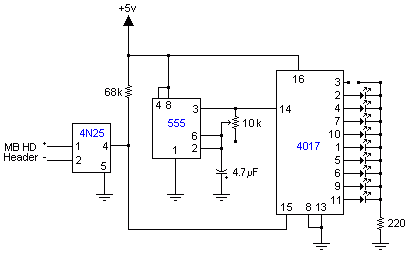 I don't know how sound this circuit is but it works. 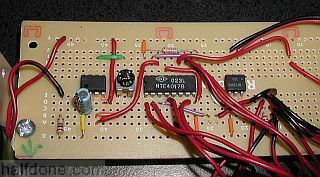 I'm reading the information at allaboutcircuits.com and so far it's the best site I've found for for eletrical theory and learning electronics. They don't cover parellel and series until chapter five, it's that in depth. And it's in a usable format, not a multicolored mess. Here is the circuit diagram I used for this project. It's almost identical to the Metku Mod project but instead of using the stop pin I used reset, added a pot so I can control how fast the gun shots and I removed a led. That way when there is no access it doesn't stop bullets in mid air but starts from the gun. I removed the first led since it would be always on if there was no hard drive access. Here also is the circuit on a breadboard. I bought some T1 3mm "bright" red leds for the bullets and soldered them to wire. Don't think they came out that bad. I'm new with soldering too. Next time I will need to buy black wire too so I can tell which is the positive and negative, ended up using a sharpie marker to mark negative. I then used hot glue to put each led to its hole. I used the utility knife to widen this side of the hole. I'm sure there is a better way to do this. I used a ton of glue to get all of them in. Perhaps I could have mounted them using T1 holders super glued to hole. At least these leds are going nowhere. 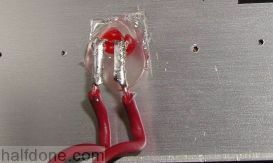 Here is my soldering job, I think it's pretty good for my first real job. Took me two days. you can see where I screwed up and cut the bullet led wires too short. 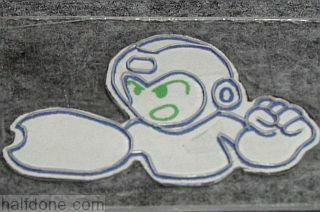 Here you can see the complete hot glue job and the megaman logo installed. I used plastic from a floppy disk to cover the back of the cutout. One other thing I noticed after all that work is that I should have put the negative side on the open side of the cover. As an earlier experiment showed you don't want the power supply's +5v line to hit the case. I covered the whole backside with electrical tape anyway. Hope the tape doesn't come off. I make sure I have the power off when I add/remove this from the system. Here are pictures of the complete project. Here is a video showing the shooting in action. For some reason the video is slower then it should be, I assume due to compressing it. If you look at it, even at a slight angle you can't see the holes at all but the lights are quite visible. 390K, Divx 5. Now that I spend almost a month off and on working on this there is a few things I would change. 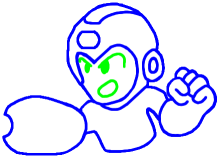 In megaman games he can charge up his gun before he fires. What I should have done is take the first 2 or 3 lights and make them progressively brighter to simulate that effect. Page last modified: June 20th, 2005 - 5:16pm Boston, USA time. 5,223,002 Hits on this page since July 20th, 2003. Page loaded in 0.017 seconds.